APA Group is to issue US$750 million of senior guaranteed notes into the US debt capital market at an offer price of 3.875 per cent. The notes mature in October 2022. The proceeds are for corporate purposes and may be used to fund part of the repayment of $1.4 billion of Hastings Diversified Utilities Fund debt if APAs takeover offer for HDF is successful. APA is now at 50.4 per cent of HDF. Lazard Asset Management Pacific Co has reduced its stake in DUET Group from 8.06 to 6.87 per cent. DUET Group subsidiary DBP has closed a $155 million seven year bank debt facility to refinance part of its floating rate notes that mature in April 2013. Stock broker Ord Minnett has commenced coverage of ERM Power with a buy recommendation. While on a traditional P/E based metric it does not look cheap for the FY13 year, we see this as a transitional year as the business has redoubled its efforts to expand into new markets via ERM Electricity. The business has optionality around the power generation development business and hard NTA in its power stations. This is an added attraction, said the broker. ERM has been quietly developing a strong position in the wholesaling and reselling of electricity to larger corporate customers in the eastern states... ERM has firmly established its position now as a distant but significant no. 4 player in this market selling 8,300 GWh (Gigawatt hours) in a 210,000 GWh Australian market. A key driver of growth is continued expansion into new states (WA, NSW, Vic) and new markets (SME and small commercial and industrial) using new systems adapted for the increasing demands of clients. ERMs main growth division, Electricity, also gains certainty from having most of FY13 sales already under contract. Generation also benefits from contracted output/capacity sales. Energy World Corporation has responded to another critical article by Sydney Morning Herald journalist, Michael West. The article questioned the status of some of Energy Worlds projects and highlighted related party transactions. Energy World refers to the claim that One vile and unseemly character who has made the scurrilous allegation that Energy World keeps on raising money to build the same LNG plant and says it refutes these allegations in the strongest possible terms. It also responds to other comments about the companys Alice Springs LNG facility, and its proposed projects in the Western Province of Papua New Guinea and LNG development at Port Bonython in South Australia. Clean TeQ Holdings and UraniumSA Ltd are to evaluate Clean TeQs U HiSAL process for the extraction and recovery of uranium from high saline acidic solutions. The process is another application of Clean TeQs suite of ion exchange technologies. UraniumSA is exploring for uranium mineralization in South Australias Gawler Craton, which has mineralization in hyper saline groundwater. The partners will investigate the use of the U HiSAL process for producing uranium from specific project sites, as well as pilot plant field trials and the economics of the U HiSAL process for UraniumSAs Samphire uranium project. The evaluation will take 18 months. Uranium SA said it has obtained excellent results from laboratory tests using Clean TeQs R 603B resin for extracting and recovering uranium from saline solutions, and that the process has the potential to provide a very cost effective approach to uranium recovery and purification. Clean TeQs chief executive, Peter Voigt, said Clean TeQ sees the U HiSAL process having enormous potential for the uranium industry as it provides an extraction and purification route that is not dependent on the availability of fresh water. The supply of fresh water, usually through a seawater desalination plant located hundreds of kilometers from the site, adds significant capital and operating cost to conventional uranium extraction routes. Shares in CMA Corporation fell to an all time low of 6.3 cents on 2 October. Energy Developments shares have reached a one year high of $2.95 due it seems to the companys share buyback where it has paid up to this amount. The most it can pay is $3.02. Energy Developments has increased its secured corporate debt facilities with a new commitment of 22 million ($28 million) from National Australia Bank and guaranteed by Finnvera plc, the Finnish Government Export Credit Agency. Energy Developments said the new facility will provide finance for the power generation units to be provided by Wartsila Finland Oy as part of the expanded power supply for McArthur River Mine owned by Xstrata in the Northern Territory. The Australian Ethical International Equities Trust has changed its benchmark from the MSCI World Index to the MSCI Global Climate Index. 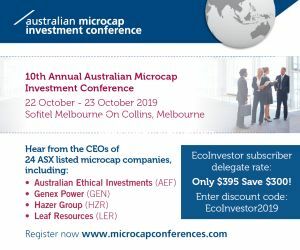 The main benefit of the benchmark change is the improved representation of the investable universe of companies exposed to the critical themes of climate change and energy security and therefore more suitable to measure performance against, said the funds manager, Australian Ethical Investment. The change has no impact on the portfolio or how it is managed. Since 31 January 2010, when the Trust became a thematic fund, it has returned 8.4 per cent per annum, while the MSCI Global Climate Index has returned 9.9 per cent and the MSCI World Index 2.2 per cent. 25 of Ceramic Fuel Cells BlueGen gas to electricity units are being used to power Germanys first commercial virtual fuel cell power plant. A virtual power plant is a cluster of electricity generation units controlled centrally using software. It allows power generation to be increased or decreased to meet peak loads and balance intermittent power from wind or solar, with higher efficiency and more flexibility than large centralized power stations. Producing energy where it is needed eases the burden on electricity networks and prevents distribution losses, which can be up to 10 per cent from large power plants using conventional generation methods. The virtual power plant was opened by Peter Altmaier, Germanys Federal Minister for the Environment; Johannes Remmel, Minister for the Environment in the state of North Rhine Westphalia; Bernd Wilmert, chairman of the municipal utility network Trianel; and Sven Becker, chief executive of Trianel. Trianel is the leading municipal utility network in Germany and Europe, with more than 50 local utilities as members and serving more than 5 million customers in Germany, the Netherlands, Austria and Switzerland. Ceramic Fuel Cells and its local distributor sanevo blue energy have delivered the 25 BlueGen units to Trianel. So far 15 municipal utilities in Germany as well as the Energie Kompetenz Zentrum Rhein Erft Kreis GmbH are involved in the project. The Trianel network will offer BlueGen units to customers as part of its EnergieBlock micro combined heat and power offering. The municipal utilities are installing the BlueGen units in their customer centres and with selected customers. There are also plans to roll out the BlueGens to end customers in apartment buildings and commercial properties. Mr Altmaier said that distributed electricity generation and energy efficiency, along with a coordinated expansion of renewable energies and electricity grids on a national level, are central elements of the electricity market of tomorrow: Virtual power plant networks are progressive milestones on the way to a successful energy reform, he said. Mr Remmel said the state of North Rhine Westphalia is planning a €250 million support program for combined heat and power (CHP). Our goal is to increase the CHP share of electricity generation to more than 25 per cent, he said. BlueGen units are also being used to power a virtual power plant project in The Netherlands with energy network company Liander and IBM. In other news, Ceramic Fuel Cells has secured a long term project for its powder plant at Bromborough in the UK. The plant uses Ceramic Fuel Cells patented equipment to make nano size ceramic powders which can be used in a range of applications and products. An unnamed multinational ceramics and specialty chemicals company will utilize the plant to develop high quality ceramic powder products. The powder plant equipment and CFCL operational staff at the plant will be allocated to the project on a full time basis. The agreement includes an option for the customer to purchase the plant and licence the related intellectual property for a pre agreed price. However, the identity of the customer and the purchase price are confidential. Shares in Carbon Polymers have been suspended due to listing rule 17.3, pending compliance with listing rules 19.11A and 12.2 in relation to its full year statutory accounts. Rule 12.2 says a companys financial condition must be adequate for continued quotation. Rule 19.11A is about the consolidation of accounts. In releasing its audited financial statement for 2011-12, Carbon Polymers said it has finalized the integration and capital costs of Reclaim Industries plant acquisition, and it is now focused on production and achieving targeted output. The directors have expensed another $2,983,923 of non-cash items for the year, of which $2,403,923 is development costs for plant and equipment. This was the reason for the variation between the preliminary results and the final results, they said. The change increased the reported loss of $3,995,151 to $6,840,716. The directors say that the companys asset base has increased from $5.9 million in 2010 to over $19 million. Liabilities in 2010 of $6.3 million have fallen to less than $5 million. Revenue grew about 700 per cent from $179,000 in 2010-11 to $1.3 million in 2011-12. In discussions with the auditors, the company over the next few months will address the goodwill aspects of the balance sheet and adopted valuations placed on certain assets held by the company. This will remove any qualifications surrounding those items. The auditors have also noted that trading conditions arising from the first half of the financial year must continue to improve for the company to prosper. Post 30 June 2012 trading conditions give the board confidence that the company will achieve this and see our current growth pattern increasing throughout this current financial year. Metals recoverer Electrometals Technologies has executed a contract worth a minimum of $3.4 million to sell an EMEW electrowinning package to a large copper producer in the Middle East. An initial deposit has been received. The plant will extract copper and nickel from a waste stream. Vmotos steep and quick share price rise from 3.1 cents to 4.2 cents drew a query from the ASX. The company said it is not aware of any information that has not been announced to the market. It reiterated its announcement of 24 September that it is currently conducting a roadshow in the UK with a view to listing on AIM in the fourth quarter of 2012, and that it is contemplating a capital raising in conjunction with the proposed listing. Carnegie Wave Energy has received the first milestone payment from its Australian Renewable Energy Agency (ARENA) grant for the Perth Wave Energy Project. The payment is $248,561 plus GST. The milestone was for the completion of the Basis of Design and completion of the community consultation and risk management plans. Carnegie said the Basis of Design includes preliminary design documents for the CETO unit, foundation system, pipeline system, mechanical interfaces and installation, instrumentation and control and power generation system and grid connection. The community consultation plan identifies all key stakeholder groups, outlines the community consultation processes to be undertaken, details how community consultation activities align with milestones and identifies the process for maintaining an up to date record of complaints and questions from community consultations. Geothermal explorer Earth Heat Resources, with a local company GeoEnergia Argentina S.A., is to evaluate the Los Molles and Peteroa projects in the Mendoza Province of Argentina. The company wants to build additional capacity in Argentina to meet its expected increases in demand from geothermal energy over the next five years. Earth Heat said the expansion has been welcomed by the highest provincial authorities and the Governor. The Los Molles and Peteroa projects are well located to infrastructure. Lithex Resources is expanding into graphite exploration with the acquisition of what it says is a significant and exciting package of Australian tenements prospective for graphite mineralization. Panax Geothermal said it has made a conservative decision to provide in full against the carrying value of its Australian assets - Penola, Limestone Coast, and Cooper Basin - and has recorded an impairment charge of $26,086,081 for 2011-12. These assets have not been written off in our accounts and should any further work provide sufficient prospects for future return, all or part of the impairment charge can be reversed, said managing director, Kerry Parker. We will continue to work closely and co-operatively with South Australian Centre for Geothermal Energy Research and University of Melbourne on our collaborative research programs on the Salamander 1 geothermal well, and hot sedimentary aquifer geothermal regions in Australia, he said. However, Salamander-1 needs considerably more work to demonstrate its economic viability. Mr Parker also made some comments about investor sentiment towards the geothermal and renewable energy sectors in Australia. Until such time as we see a substantial commitment of funding from the Australian Government towards developing Australias significant geothermal resources, Panax does not intend to commit any significant amount of its own funding towards progressing our Australian projects. The feedback from the investment public  both in Australia and internationally  in regard to investment in Australian geothermal projects is clearly on this basis. The investment public view is that the Australian Government needs to commit significant and real funding towards the reservoir development aspects of geothermal projects in Australia, as a clear signal of support to the investment public. Our recent investor presentations completed as part of our rights issue capital raising, have confirmed the current sentiment of Australian and Asian based investors towards the Australian renewables sector, as a result of the clear in action on the part of the Australian government. Petratherm said that two of its largest shareholders, Minotaur Exploration Ltd (15.27 per cent) and Australian Ethical (7.13 per cent) intend to participate in its pro rata rights issue. Minotaur Exploration and Australian Ethical have committed for $218,778 and $105,995 respectively.